Size of Male: 45-65 lbs., 22.5-27.5 in. Size of Female: 45-65 lbs., 22.5-27.5 in. The Ibizan Hound (I-bee-zan or I-bee-than) is a very old breed that may have been brought to the island of Ibiza (known as Eivissa today) by the Phoenicians in ancient times. The dogs developed on this island and are superior hunting dogs. They’ve been popular in Spain and parts of France for hunting rabbits for centuries. This breed is a gentle, kind-natured dog. They’re affectionate and loyal. They make excellent family pets, but you should have a very secure yard with this breed. They have amazing jumping skills. The Ibizan Hound strongly resembles images found on the tombs of pharaohs in ancient Egypt and it has long been theorized that these dogs are the descendants of ancient Egyptian hunting hounds. However, DNA evidence has not backed up these assumptions. Another theory about the breed, to explain its long history on the island of Ibiza off the coast of Spain, has been that the ancient Phoenicians brought the dogs to the island several thousand years ago. Whether this is true or not is unknown, but no one has come up with a better explanation for how these sighthounds came to be on an island in the Mediterranean where they have been for centuries. The Phoenicians are said to have discovered the island of Ibiza in the 8th or 9th century BC and presumably taken the dogs with them for some purpose. The dogs have, without question, been present on the island for a long time, where they are used for coursing rabbits and other small game over difficult terrain. These dogs have also been popular as hunting dogs on mainland Spain and in France over the centuries. The Ibizan Hound is a friendly, gentle and good-natured dog. They are considered moderately intelligent and of average working/obedience intelligence. They ranked 53rd on Dr. Stanley Coren’s listings in The Intelligence of Dogs . Like many sighthounds, these dogs can be independent and stubborn on occasion. This is the result of the way these dogs hunt, since they need to make decisions for themselves in the field. This breed gets along well with other dogs but they should not be trusted with other small pets in the home. They have a strong prey drive and may consider a cat or other small pet to be prey. They are very good with children. These dogs don’t bark very much but they will usually bark to let you know someone is approaching. However, they are generally aloof with strangers but not challenging. Like many sighthounds, they can be sensitive, so you should avoid any harsh training methods. They need to be with people and they need a lot of daily exercise. They will enjoy having a place to run but do not allow them off-leash unless you are in a safe, enclosed area. They will likely ignore you if they see something to chase. These dogs are also able to jump fences, so make sure you have a tall, secure fence for your dog. Living Environment – The Ibizan Hound can adapt to living in an apartment if you provide plenty of daily exercise. They are generally quiet and calm in the home and rarely bark. They do not make good kennel dogs. These dogs want to be around people and they will be unhappy if they are isolated. This dog breed was developed in a warm climate and they are sensitive to cold weather. Grooming – Grooming for this breed is not difficult. There are two coat types: the smooth coat and the longer wire coat. (Longhaired dogs are considered a kind of wirehair.) In either case you will need to brush the dog regularly and bathe as necessary. Diet & Exercise – Dietary needs are considered normal for this dog breed. However, as a sighthound, they can be prone to bloat, so it’s best to feed them 2-3 small meals per day rather than one large meal. These dogs need a great deal of exercise. They enjoy a good run, but make sure they are in a safe, enclosed area. If you allow them to run off-leash they are likely to run and not come back, especially if they see a small animal. Consider jogging with your dog or attaching his leash to a bike and going for a slow ride. Health – In the health department, this is considered a relatively healthy dog breed, but there are some health issues. They can have seizures or dog allergies. Axonal dystrophy appears in the breed, as do cataracts, retinal dysplasia and deafness. None of these conditions is widespread. If you are interested in this dog breed you should talk to a breeder about possible dog health problems. As sighthounds, this breed is also sensitive to anesthesia. You should make sure your veterinarian is aware of this issue. The Ibizan Hound is an intelligent dog and they learn quickly. 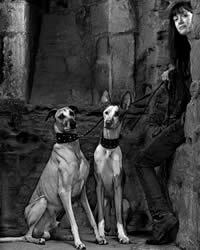 Like many sighthounds though, they can be independent and willful at times. They can become bored with dog training unless you find ways to make it interesting for them. Try to find ways to motivate them. This is a sensitive breed, so harsh training techniques will never work with them. Use positive dog training (praise, reward) and you should achieve good results.